Jersey dress with contrast border trim. Compact stretch-viscose jersey dress. Floral-lace topper and hem. High neckline with velvet bow detail. Flutter sleeves. A-line silhouette. Hidden back zip. Mid-thigh length. Viscose/nylon/spandex. Made in Italy. 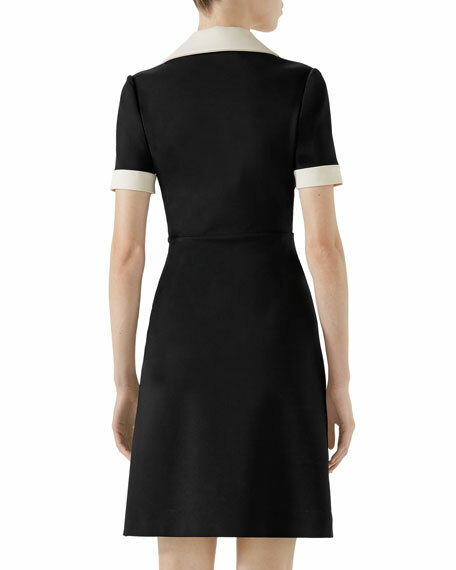 Gucci tweed dress with embroidered ribbon trim and golden detailing. Boat neckline. Short sleeves. Decorative metal buttons. Sheath silhouette. Hits below the knee. Back slit. Unfinished edges. Back zip closure. ... Made in Italy. Short dress in compact stretch-viscose jersey. Crystal trim and bow detail. Spread collar. Short sleeves. Fit-and-flare silhouette. Center skirt pleat. Short dress in compact stretch-viscose jersey. Crystal trim and bow detail. Spread collar. Short sleeves. Fit-and-flare silhouette. Center skirt pleat. Hidden back zip. Mid-thigh length. Viscose/nylon/spandex. Made in Italy. Soft silk duchess two-tone cocktail dress with jacquard skirt. High neckline; jeweled bow detail. Sleeveless. A-line silhouette. Hidden back zip. Soft silk duchess two-tone cocktail dress with jacquard skirt. High neckline; jeweled bow detail. Sleeveless. A-line silhouette. Hidden back zip. Mini length. Viscose. Made in Italy.